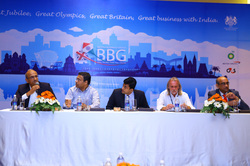 The 2nd BBG National Conference was held in Chennai on 28-29 Sep 2012. The conference got off to a rousing start on 28th September evening with a Welcome Reception for visiting delegates at “Cottingley”, the iconic official residence of Mike Nithavrianakis, Deputy High Commissioner for South India. Even the weather gods seemed to smile on benevolently as the threat of rain receded and the visiting delegates and senior business leaders from the city were treated to a sparkling classical dance recital followed by cocktails and dinner. On the morning of 29th, as the guests at the Conference venue – the spanking new Hyatt Regency marvelled at the hotel’s special collection of art works by artists from around India and leafed through the booklet in the Conference folder explaining the theme on bee-conservation and how the bee-hives came to be in the hotel structure. Chennai BBG Member, Latha Menon presented a nostalgic documentary “Old Madras & Chennai Today”, on Chennai’s business history with it’s 373 year-old City Corporation and 176 year-old Chamber of Commerce. The High Commissioner for India, Sir James Bevan then set the tone for the event with his well reasoned “Four myths and One Big Idea”. Dr Anupam Srivastava, CEO of Invest India then delivered the co-inaugural address, highlighting the mission of Invest India, – promoting foreign investments in India in a focussed, and structured manner while acting as a first reference point to provide quality inputs and support services of prospective foreign investors. He congratulated the efforts of the British business community in building partnerships with Indian businesses in promoting trade between the two countries. He extended support services of the Invest India to the BBG membership, particularly to the SMEs and family owned overseas enterprises. The British Business Group in India : What Now? in style with his concluding remarks. Refreshing cocktails and a scintillating dance performance by the Abhinava Dance Company, Bangalore followed by Gala Dinner brought a long and great day to a close. The evening was particularly special for Louise Dawson of BBG Chennai who won the lucky draw for a British Airways Return Club Class Ticket to London. You can download the Post Conference Report here.